CJSC Scientific and Technical Center “SIMOS”-is Russian company busy with development, manufacturing and implementation of telecommunication equipment. Main production is digital information transmission systems over copper and fiber optical cables using advanced technologies. 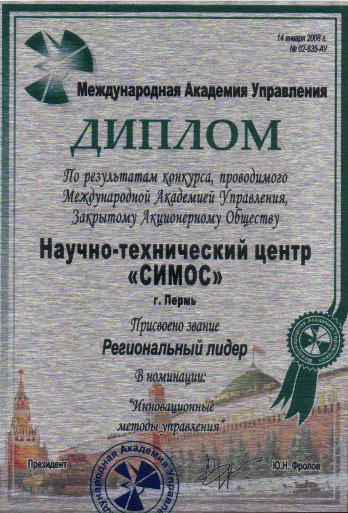 Scientific and Technical Center “SIMOS” includes R&D department and own manufacturing with effective quality control system. The Company specializes on development and manufacturing of following telecommunication equipment: subscriber loop multiplexer systems, data transmission and line links over copper and fiber optical lines, subscriber’s access to IP networks, specialized in communications field and dedicated measurement equipment. 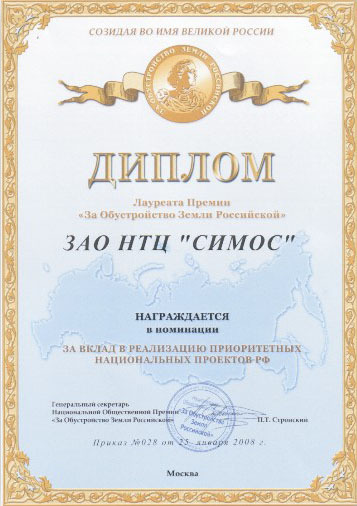 For its contribution into realization of national projects“SIMOS”company was honored with National prize“Best Company – 2007”, Award of International Management Academy “Regional Leader”in “Innovative management methods” nomination, Award of International Social Sciences Academy “For the Development of Russia” in“Gold”nomination. At present timeCJSC STC “SIMOS”is one of the leaders on the market of telecommunication equipment developers and manufacturers. Among the customers of the Company are such enterprises and institutions as JSC “Gazprom”, JSC System Operator of “Unitary Energy System”. 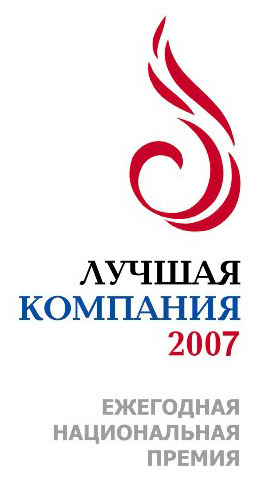 JSC Federal Network Company “Unitary Energy System”, “Interregional Distributive Network Company” Holding, JSC “Rostelecom”, JSC “Svyaztransneft” and many others. One of priority tasks of the Company is technical support of the customers, starting from pre-project researches including crating of specification up to commissioning works and commissioning into exploitation Unitary Energy System.